Berkeley Plantation, one of the first great estates in America, comprises about 1,000 acres (400 ha) on the banks of the James River on State Route 5 in Charles City County, Virginia. 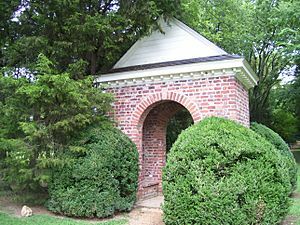 Berkeley Plantation was originally called Berkeley Hundred and named after the Berkeley Company of England. 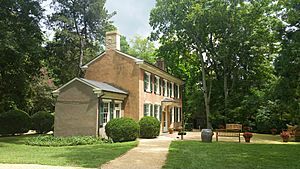 Benjamin Harrison IV built on the estate what is believed to be the oldest three-story brick mansion in Virginia and is the ancestral home to two Presidents of the United States: William Henry Harrison, his grandson, and Benjamin Harrison his great-great-grandson. It is now a museum property, open to the public. First time Army bugle call "Taps" played: July 1862, by bugler Oliver W. Norton; the melody was written at Harrison's Landing, the plantation's old wharf, by Norton and then General Daniel Butterfield. Bourbon whiskey was originally distilled at Berkeley Plantation in 1620. On December 4, 1619, a group of 38 English settlers arrived at Berkeley Hundred, about 8,000 acres (32 km2) on the north bank of the James River near Herring Creek in an area then known as Charles Cittie. It was named for one of the original founders, Richard Berkeley, a member of the Berkeley family of Gloucestershire, England. It was about 20 miles upstream from Jamestown, where the first permanent settlement of the Colony of Virginia was established on May 14, 1607. The group's London Company charter required that the day of arrival be observed as a "day of thanksgiving" to God. On that first day, Captain John Woodleaf held a service pursuant to the charter which specified, "Wee ordaine that the day of our ships arrival at the place assigned for plantacon in the land of Virginia shall be yearly and perpetually keept holy as a day of thanksgiving to Almighty God.". After several years, the site became Berkeley Plantation and was long the traditional home of the Harrison family, one of the First Families of Virginia. In 1634, it became part of the first eight shires of Virginia, as Charles City County, one of the oldest in the United States, and is located along Virginia State Route 5, which runs parallel to the river's northern borders past sites of many of the James River Plantations between the colonial capital city of Williamsburg (now the site of Colonial Williamsburg) and the capital of the Commonwealth of Virginia at Richmond. 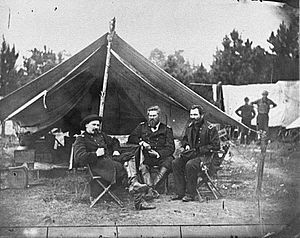 Colonels Albert V. Colburn, Delos B. Sackett and General John Sedgwick in Harrison's Landing, Virginia during the Peninsula Campaign, 1862. Using bricks fired on the Berkeley plantation, Benjamin Harrison IV built a Georgian-style three-story brick mansion on a hill overlooking the James River in 1726. Berkeley would later earn a distinction shared only with Peacefield in Quincy, Massachusetts as the ancestral home for two United States Presidents. Harrison's son, Benjamin Harrison V, a signer of the American Declaration of Independence and a Governor of Virginia, was born at Berkeley Plantation, as was his son William Henry Harrison, a war hero in the Battle of Tippecanoe, governor of Indiana Territory, and ninth President of the United States. 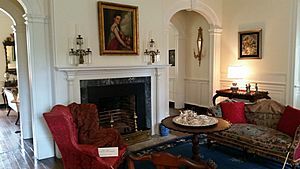 During the American Civil War, Union troops occupied Berkeley Plantation, and President Abraham Lincoln twice visited there in the summer of 1862 to confer with Gen. George B. McClellan. The Harrisons were not able to regain possession of the plantation after the war, and it passed through several owners' hands and fell into disrepair. Berkeley is still a working farm; corn, soybeans, wheat, tomatoes, and other vegetables are grown here. There is also a small family cemetery on the property. Among those buried here are Benjamin Harrison, Grace Jamieson, and Malcolm Jamieson. In 1907, Berkeley Plantation was bought by John Jamieson, a Scotsman who had served as a drummer boy in the Union army during the Civil War. His son, Malcolm Jamieson (who bought out the interests of other heirs after John's death), and Malcolm's wife, Grace, restored the manor, which had been in deteriorating condition. Today the house attracts visitors from the United States and other parts of the world. The architecture is original, and the house has been filled with antique furniture and furnishings that date from the period when it was built. The grounds, too, have been restored, and cuttings from the boxwood gardens are available as living souvenirs for its visitors. The main house is the centerpiece of ten acres of formal gardens and parterres. The house is surrounded by boxwood hedges forming allées. Large pillars with decorative spires support large hinged gates. The house is constructed of red brick with thin mortar joints. The two story building's main entrance is in the center of the house, with two symmetrical windows on either side and a central window directly above the door. These windows are double sashed with 12 panes per sash. An entablature with dentil moldings support the gabled roof, which is pierced by three dormer windows and two large brick chimneys. Berkeley Plantation Facts for Kids. Kiddle Encyclopedia.